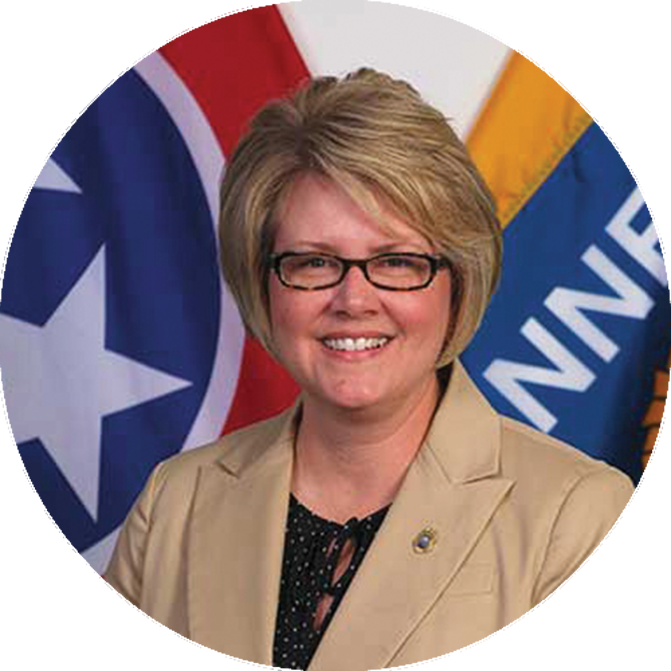 Margie Quin was promoted in 2007 to Assistant Special Agent in Charge at the Tennessee Bureau of Investigation (TBI) which included duties as the state AMBER Alert Coordinator and Missing Person Clearinghouse Manager. She also began working on human trafficking cases in 2010. Quinn specialized in electronic surveillance for drug cases when she started with TBI in 1998. Prior to joining TBI, Quinn served for 5 years with the Cobb County, Georgia, Police Department. WHAT IS UNIQUE TO YOUR AMBER ALERT PROGRAM, AND WHAT DO YOU THINK HELPS MAKE YOUR PROGRAM SUCCESSFUL? The Tennessee AMBER Alert program has been successful from its inception because of the great partnerships that were formed at the beginning. The Tennessee broadcasters, Department of Transportation and the National Weather Service were instrumental in building a great partnership that elevated the credibility of the initiative statewide. For the last 10 years, Tennessee has tried to stay on the cutting edge of child abduction response. We certified our Child Abduction Response Team (CART) program in 2009, the fourth team in the country to achieve certification. We have re-certified every year since. We also continue to train and work with local agencies to improve the immediate and initial response to missing children incidents. The state has gone from averaging 10-12 activations per year to 5-6 per year over the last 2 years. We believe this is because of the efficiency in response at the local level. The challenges in maintaining the effectiveness of the AMBER program are technical and environmental. The technical challenges continue to evolve as technology improves. The quick notification to the public is still the key to recovery in so many cases. That being said, AMBER, along with other alerts, must compete for the attention of the American public. In this technology age, peoples’ attention is often divided between numerous things and across a wide array of devices. Capturing the public’s undivided attention is the great challenge in 2017 and beyond. WHAT WOULD YOU LIKE TO SEE HAPPEN WITH YOUR AMBER ALERT PROGRAM IN THE FUTURE? The program should continue to evolve and change with “the times.” I would like to see the program devote more time to training and awareness in 2017. PLEASE SHARE DETAILS ABOUT YOUR MOST MEMORABLE AMBER ALERT SUCCESS STORY. In 10 years, there have been so many cases. One stands out recently that was a case out of Knoxville, Tennessee. A woman was murdered by her estranged husband and he took their 3-year-old child. He used her ATM card in Ohio, and within 45 minutes, Ohio activated its system and a citizen quickly called about being behind the suspect’s vehicle. In that case, the AMBER Alert activation directly resulted in the recovery of the child. It worked in the exact way it was designed to work. HOW HAVE YOUR CAREER AND LIFE EXPERIENCES, INCLUDING YOUR WORK AS AN AMBER ALERT COORDINATOR, STRENGTHENED YOUR COMMITMENT TO HELPING ENDANGERED, MISSING AND ABDUCTED CHILDREN? How has it not? That might be easier to answer. If we aren’t out here working for the kids, who are we working for? There is no more vulnerable population than children. They are also our most precious resource. We must continue to do all that we can to protect kids in this country.